Continuing on the whale theme today, an Australian couple has had an extraordinary windfall: walking along a remote beach they found 32-pounds of sperm whale puke, for which the proper scientific word is ambergris and the technical details are that ambergris is a solid waxy substance originating in the intestine of the sperm whale (Physeter catodon). At first this may seem like a disgusting curiosity worth no more than a moment of notice for its scientific value, but in fact the monetary value of the discovery is estimated to be over $1 million USD! 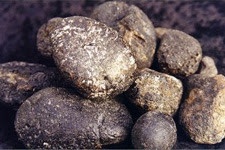 Ambergris, often referred to as ‘floating gold’ is prized by perfume makers and sold for up to $90 USD/gram (gold is worth about $25 USD/gram). But trading ambergris is controversial and technically illegal. CITES (Convention on International Trade in Endangered Species) forbids trade of certain animals’ products for commercial purposes. However, it has difficulty committing to a ban on waste products by animals. It is not clear what will happen to the find. Though it is illegal to trade, precedent has thus far allowed its exchange. Sarda Sahney is a Ph.D. student at the University of Bristol studying macroevolution, with focus on the evolution of vertebrate communities.